Do you remember the old days, when the only ways for businesses to engage with customers was by costly TV ads or communicating with their customers via post? Thanks to the internet and mobile technology, it's so much easier for businesses to connect with you. For business owners, this means there are hundreds of ways you can now communicate. Let's explore four popular modern methods and see how the professionals use them to market their business. Let's start with the most obvious way of communicating in the modern age with your customers. Email. With email marketing you can schedule emails, every week directly to your customers' inbox. Email is one of the most popular forms of marketing for businesses. It's cheap and it's direct. But the problem most businesses have with email marketing, is their emails get redirected straight into the spam bin. You need to make your emails interesting to stop people ignoring them. With Hubspot you can sign up to 3 different blogs (Sales, Marketing and Agency) which send out 3 different types of newsletter. This solves the relevancy puzzle and means that HubSpot's message in each email doesn't have to be split three ways. As I'm signed up to the Marketing Blog, I can see all the latest content they have created and it's relevant to my interests. If they randomly sent me sales pitches, I wouldn't be interested and likely ignore them. 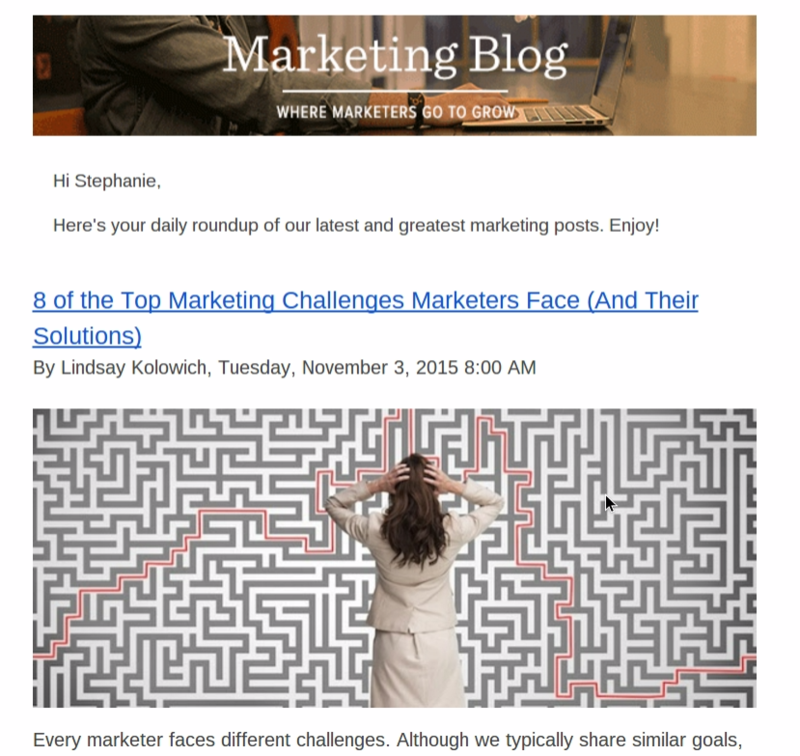 These blog updates are useful and because they help widen my own knowledge, I look forward to my daily roundup of Hubspot's marketing blogs. When was the last time you looked forward to receiving an email? 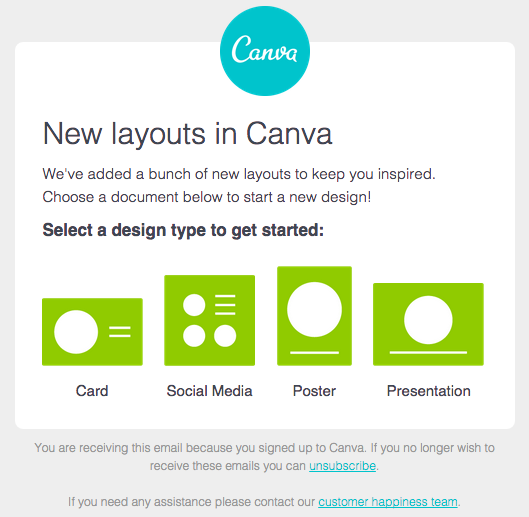 Canva's email marketing focuses on design rather than content. As it's an online graphic design tool, using design images and templates to talk to their customers, works. The simple nature of the email gets straight to the point and invites the reader to visit their website and have a go for themselves. What makes these businesses' email strategy work is the well designed layouts, they keep to the company's brand and they are interesting to read. These are three factors you should consider if you want to be successful in your marketing strategy. Remember your Buyer Persona and tailor your message to their needs. Having a 'sign up' box on your website. Invite people to sign up with their email address so they can get the latest information or blog posts. Have a real-life shop? Every purchase at the till is the perfect opportunity to ask people to sign up for your email. This way you can send them special offers and let them know when that pair of shoes comes back into stock. eCommerce sites often require an email at the checkout. Not only does this allow for a confirmation to be sent instantly, it also allows you to use this address for any future marketing communication. Once you have people to email, think about what you want to send to them. Take inspiration from the examples above. Split out your database and tailor messages to them. The total population of the world is approximately 7.210 billion and 2.078 billion of these are active users on social media! Newsflash - there are LOTS of opportunities for you to engage with potential customers. Whilst setting yourself up on social media seems like an obvious point to make - you don't need to be on every single platform. Set up social media accounts that will be a useful means for you to communicate with customers. If you use a lot of images, you can do well on Pinterest and Instagram. If you're a B2B company then you need to get on LinkedIn. Use the social platforms that will help you engage with customers. 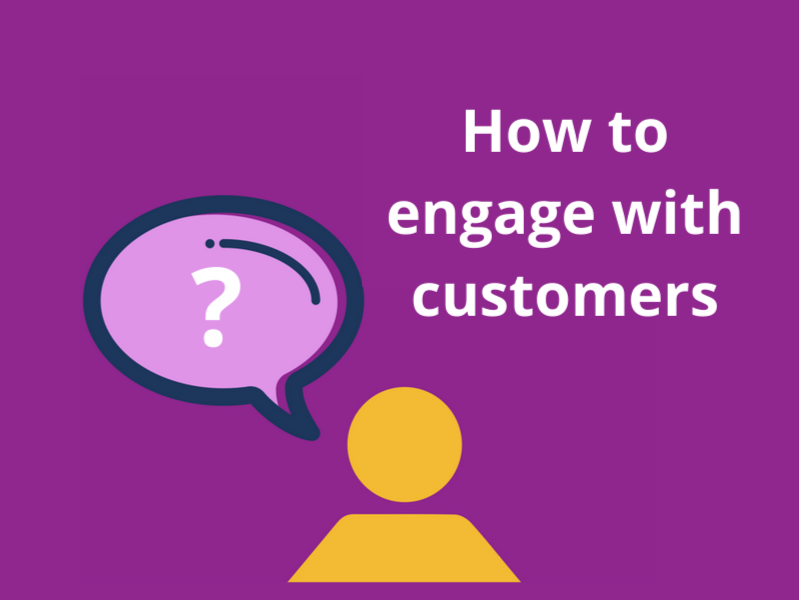 How will you engage with customers? What tone of voice will you use? What interesting content or images will you share? How can you make sure there is consistency in your brand messages throughout all your social media platforms? Can you create a guideline strategy for your team? Can you repurpose old content in an engaging way for a new platform? There are millions of voices on social media so it's difficult to stand out from the crowd. Being successful on social media is not about forcing your products into people's faces every hour, be smart with your advertising. If you need inspiration to get started, have a look at some of the experts on social media. Creating videos that become viral, is much easier said than done. Sometimes you're just lucky it becomes an overnight hit but today more businesses are focusing on online video marketing. More people are watching Youtube instead of regular television so businesses can benefit from using video advertising, if they can create sharable videos that capture people's attention. Old Spice has even created videos that answer questions sent to them via social media. Using videos to connect directly with their customers. We understand it can be a great expense getting started with video advertising, especially if you want them to look professional. So you can start small, find common questions your customers ask and create individual videos to answer them. You can then upload them onto your website and Youtube. Short videos like this can improve brand engagement with your audience and they will appreciate your effort to respond. So many businesses are making apps. These software applications can be easily accessed on a phone or tablet to give an instant service. Customers can make a purchase with a simple click of a touch screen. Although this is a game, it's an excellent example of how to encourage someone to get back onto the app. Every time you finish playing Crossy Road, you will receive a reminder to play again. If you ignore that, they will send you another reminder later and offer you a free gift in exchange for playing the game again. It's a simple methodology but it works... From my experience, it works. 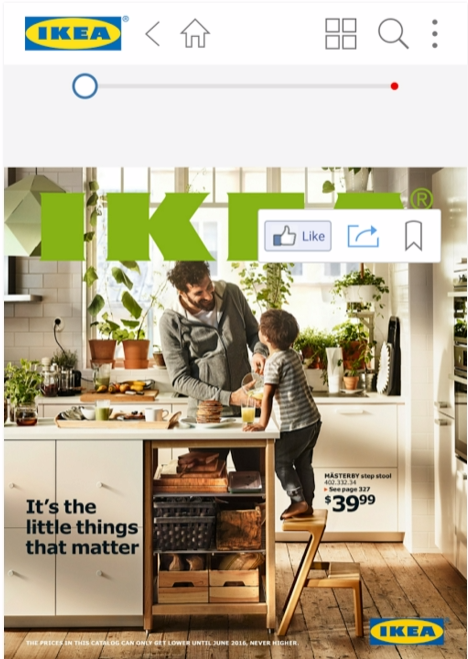 Many retail businesses are doing it now but as IKEA was one of the first, we'll use them as an example. Sending physical paper copies of catalogues can be very expensive and a waste if your customer doesn't read them. A catalogue app gives customers a digital copy and you can update it when you have new stock to add. This is an instant connection with your customers. Now, thanks to mobile technology apps can learn a location and push relevant location based offers to a user directly. 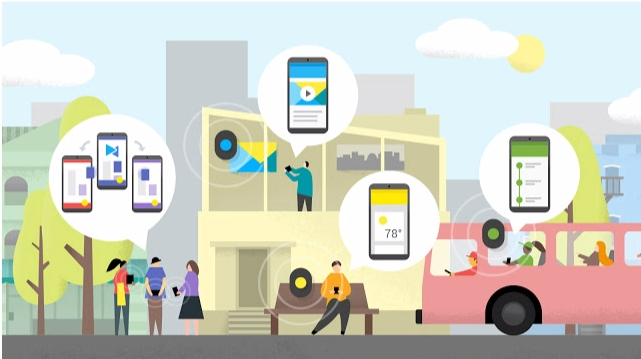 Bluetooth Low Energy (BLE) beacons can be positioned throughout a city on bus stops, inside businesses, in front of buildings and landmarks to provide you with information. These BLE beacons are currently in development but they are set to revolutionise the personalisation of communication for retail business and beyond. Not ready to start with apps? Apps can be an expensive piece of tech if you're just a start-up company but you can takeaway some helpful advice from the success of apps. People love the mobility of an app, direct information and helpful reminders. You can createcatalogues to keep people informed and contact your customers regularly via email to send them useful content and friendly reminders to stay engaged. Until you can create your own app, use their successful behaviour to communicate with your customers. Emailing, social media, videos and apps are the obvious choices for communication in 2015. Unfortunately, far too many business owners overlook the importance of specification, individuality and focus. User can mark as spam, use ad-blockers and unsubscribe at the touch of a button. The statistics show us that audiences are more responsive to inbound communication. By ensuring you categorise your message and stick to the pain points of your ideal customer, you'll be 'on message' with every message. What did you think of our blog? Share your thoughts in the comments below.